Impressive. It was like watching a team we haven’t seen in the Villa colours for a while. One that you could be proud of supporting. Villa bossed Liverpool from the start and made it hard for the home team to ever get a real foothold in the game. If it wasn’t for a certain Mr Suarez, it would have been back-to-back wins at Anfield, although the team’s resilience was welcome in not letting a point slip. 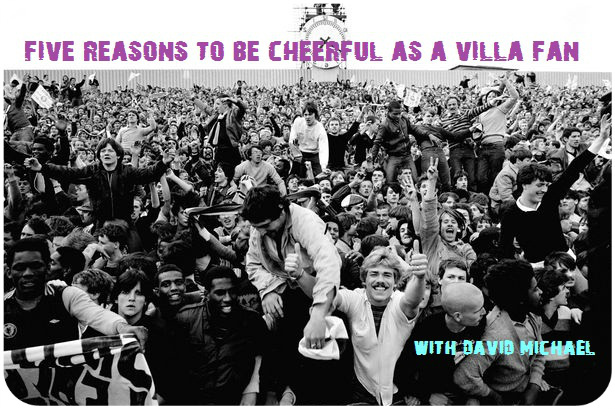 No three points after being 2-0 up, but plenty to be cheerful about as Villa fans. 1. Little sign of the hoof. Passing, movement off the ball, incisive runs, the Villa team were virtually unrecognisable from the one we’ve had to suffer in recent weeks. The first half was perhaps the best Villa have played all season, taking the game to Liverpool and dominating the possession in the early stages. They were a little unlucky with the timing of Liverpool’s first goal, but there wasn’t the momentum switch most expected in the second half. Villa kept to their game plan and principles, and even with two big men up top, after Holt came on, didn’t just pump it up. It was a controlled performance. Liverpool were forced to make 59 defensive clearances in the game, while Villa only had to make just 28. As a result, the expected Liverpool surge never really came and they only equalised through a dubious penalty. 2. Gabby Agbonlahor was on fire at Anfield and again showed his full worth to Villa when he’s on song. When Villa pass their way through their opposition on the counter, with his speed and power, there are few better. His decision making and final ball have seen a marked improvement in recent seasons, and it was good to see him providing assists that could and should be more frequent. A good second-half to the season from Agbonlahor would pretty much guarantee a top-half finish from Villa. 3. To those fans who wanted to ‘cash in’ on Christian Benteke in the January window, because he had been on a drought, go f**k yourselves! Such periods happen to the best striker. Judging by last season, Benteke is world class and Villa would be seriously hard-pushed to find a replacement with anywhere close to his ability and potential. He was a slow starter last season too. That’s two in two and you get the feeling he’s just starting to warm-up. Didn’t anybody tell you? He was just pacing himself for the World Cup! 4. Ryan Bertrand – a very decent start. He looked to be solid and didn’t get drawn into the middle, like other full-backs I could mention. It meant Villa kept a better shape, which largely contained Liverpool, who have been in devastating form at Anfield this season. Hopefully, we’ll see more of Bertrand going forward in home games, where he can add a bit more much-need dimension to Villa attacks. Certainly Bertrand signing this week has eased a bit of pressure off Lambert’s back. one swallow does not make a summer. But seeing a swallow makes it clear summer is coming. we hope. this was an excellent performance, the whole team was on song. Now for the other 16 games. It will be a long season, but Weimann and Benteke scoring, Clark hitting the post, Westwood firing in, Gabby on fire, it was hard to tell this as the VILLA side of the last three months. But the really impressive thing was the last half hour. Not folding. Sylla holding the midfield in a way KEA could never do. Luna coming on and holding firm. Gabby replaced by Holt…. not a fair swop, but While we lost attacking flair he did enough. Now to build on this. this side showed character and reslilience and some real skill. It was good to watch it. Villa where actually very lucky not to have a player sent off for elbowing Suarez. Poor refereeing decided who got the points. No intent involved in that challenge. I wouldn’t be too happy as Rodgers was the reason why Villa dominated first half with retarded tactics. Suarez was clipped so he had every right to look for the penalty. I’d be more disappointed with a Villa player getting a small push in the chest and going down holding his face like a heavyweight boxer punched him looking to get Sturridge sent off.